Just yesterday, the news came out that Apple had retaken the top spot in smartphone market share on the heels of the iPhone 5 success, but it looks like the news isn't all good for Apple as it has continued to lose tablet market share to Android. Of course, just like the smartphone market share, this may not be indicative of an overall trend. As we mentioned in the smartphone market article, Apple's market share tends to get a boost in Q4/Q1 because of its early fall release pattern, then Android will come along and reclaim the lost share in Q2/Q3, mostly on the back of the new Samsung Galaxy S model which usually hits in February/March. Given that Apple looks like it has shifted its tablet release to the fall as well, with the announcement of the iPad mini and iPad 4 last month, we may start to see a similar pattern with the tablet market. According to new numbers from ABI Research, Apple's iPad still made up a majority of tablet shipments in Q3 of 2012 at 55%, but that the company still ended up losing 14% of the share to Android, namely Samsung, ASUS, and Amazon. Since Amazon is included, it should be noted that the numbers do reflect all Android-based tablets, and not just Google Android tablets. Interestingly, ABI is also predicting that the iPad mini will not help Apple reclaim any market share because the 7" tablet market is one that is already dominated by Android. And hopefully the new competition will spur Apple to up its game. Like starting with a new UI. Lol i wouldn't count on it with Apple's track record.. Instead they would rather sue people then out-innovate them. Steve Jobs is dead. The guy in charge of iOS has been fired. Going by their "track record" would be a bit unwise. Um get your info right next time. The guy in charge of APPLE IOS MAPS WAS FIRED. OOPS sorry for your your miss understanding. That last sentence was a known fact by ALL of us, and we all know it! Slowly but surely the inevitable will come to pass....The Fall of Apple has Begun! Asus is the best among Android tablets. The Transformer Series is definitely giving the iPad a run for its money. Especially in the productivity department. I see the N10 also giving it a run because the price and screen resolution are incredible. Likely businesses will shift to W8 tablets also, so there's that aspect to consider as well. Agreed. I am getting a Nexus 10 with productivity in mind. If money was no factor, I would get the Transformer Infinity for the keyboard, but the price of the Nexus 10 is too good to resist. I have had an iPad for nearly three years. Time came to upgrade to a faster device. I played with all options and still went with iPad 4. I have owned many Android devices and the apps still not utilizing larger screens or tablets is bother some. I also travel a lot and have movies and tv shows on iTunes. Googles limited library in the Playstore is still surprising. End of the day it becomes personal preference. I cam very close to going with Transformer Prime TF700 but changed my mind. Personal preference, i respect that. I only resent Apple business tactic thermonuclear my foot. Its called running a decent business. If apple ever exist in the 1800's, we will still be struck at the stone age. Well the iPad Mini did it for them. Honestly. What can they do after the iPad? With the OS Being so closed and their hardware being so "apple" They will keep making it thinner and whatnot until they come out with the iPad 7. Which will be as thin as a leaf...This is what i love about android. Variety. Want a bigger screen. You got it. Want Crazy high definition. You Got it. Want a powerhouse? You Got it. Want a cheap tablet? yep. theres one out there too. Android give you the power of choice and price. I have nothing against apple. But in terms of design and OS. They have officially hit a wall. Their maps and that iPad Mini proved that. Well said. I am interested to see what their 'next big thing' is. As you said, I believe they have hit somewhat of a barrier as they are trying to come out with something new to revolutionize the market, but may be struggling to do so. Their products are slightly stagnating, but as long as they keep adding just enough to make the next one worth buying, they will be okay for awhile. I'm pretty sure that the "the next big thing" quote belongs to Samsung. Also what you said "but as long as they keep adding just enough to make the next one worth buying, they will be okay for awhile." they do that, they just give each new product a new version of ios. They dont really do anything internally though. Yes, I know that Samsung started that phrase, that's why I said "their" 'next big thing' is. And I don't like that they barely add new stuff, but I'm just stating what I believe to be the facts. That they will still survive for a little while without actually doing anything major. I'm fine with Apple making an iPad Mini, but not with the way in which they did it. Other than size, it is no different than the iPad 2. Same processor, screen resolution, same apps, everything.... except screen size. (and maybe camera for those creeps that use a camera on a tablet) If they made it more useful and actually different than a full sized iPad, it might make sense. The Nexus 7 is ENTIRELY different when compared to the N10. The main orientation of the devices are different (lanscape vs portrait). These are Q3 numbers. From the news about sales over Black Friday, Apple seems to be selling a lot. The trend may reverse once Q4 numbers come in. The black Friday numbers were good bit a decline from last year. Plus remember the tablet market is growing. i dont know... maybe apple might be the loser again.. if they dont make new marketing! The ipad just is not the best tablet out there - just the most memorable and marketable....slowly, change is a-coming and APPLE will not like it one bit. Am i right to point out that statement that Apple has taken top spot with market share is misleading. They only had a higher percentage of market sales for the given period didn't they? 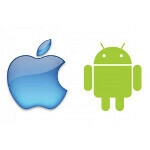 Android still has by far a greater number of devices in users hands compared to the iPhone.